14% of people would rather clean toilets than floss. Here's a better alternative. Ok, I admit it. I hate flossing. I am not exactly sure why…maybe it is the feel of the string against my gums or how hard it is to release the floss when it is forced down between teeth that are very close together. Whatever the reason, I just don’t like to do it, even though I know that it is “good for me”… so, I don’t. Evidently, I am not alone when it comes to an aversion to flossing. A 2015 survey found that 18% of respondents would rather wash dishes and 14% would rather clean the toilet than floss! In fact, only 30% of the population flosses daily which is about the same percent of people who say they never floss and close to the same number of people who admit to lying to their dentists about how often they floss. A few years ago, after enduring endless “bad flosser” lectures from my dentist, hygienist, and husband, I decided to get my teeth cleaned monthly instead of twice a year. I thought that would make up for my flossing failures, but it did not. The plaque still built up and my gums were still inflamed. My dentist eventually recommended that I buy a water flosser and I was glad; warm water pulsing against my gums is ever so much more pleasant than forcing waxy string between my teeth. So, when I got a pitch to do a story on Waterpik’s Water Flosser having received the American Dental Association Seal of Acceptance, I decided to learn more about water flossing. Full disclosure: Waterpik sent me a complimentary Aquarius Designer Series Waterpik Waterflosser to try out—as its name implies it is nicer looking, smaller, and lighter than my older water flosser. I also interviewed Deborah Lyle, a registered dental hygienist with more than 35 years in the field, who serves as Waterpik’s Director of Professional and Clinical Affairs. You can listen to the interview here. Plaque is a soft, sticky film containing millions of bacteria that constantly forms on your teeth. Although brushing can remove plaque from the front and back of your teeth, it is not an effective way to remove plaque and food particles that wedge in between teeth and below the gum lime. If not removed daily, plaque can harden into tartar, a thick white substance that you can see and, in some cases, feel with your tongue. Tartar is much more difficult to remove than soft plaque and may require a trip to the dentist so the hygienist can scrape it away. 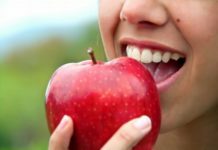 The bacteria that live in plaque thrive on sugars in the foods we eat and, as a by-product of their metabolism, produce acids that break down tooth enamel. This can result in those loathsome cavities (also known as caries) that require drilling and filling. Left unchecked, plaque can cause gums to become inflamed: red, swollen, and prone to bleeding. This is a condition known as gingivitis; it is an early stage of gum (periodontal) disease. Gum disease not only places teeth at risk of decay or loss, but it has been associated with increased risk of health problems elsewhere in the body, such as heart disease, diabetes, dementia, rheumatoid arthritis, and premature birth. How does water flossing work? Water flossers allow users to direct pulses of water under pressure to the areas hard to clean with brushing alone. The flossers come with a variety of attachments including brushes that help people with braces clean between the wires. You fill up a reservoir with warm water and point the tip of the flosser toward the teeth, systematically aiming at the gum line and in between the teeth. Usually, you do this after brushing and rinsing, but I have, on occasion, used the flosser first, only to be shocked by the large amount of food particles flushed out of my mouth by the flosser. Even worse than seeing all that stuff in the sink is the new-found knowledge that had I not water flossed after eating, all of that debris would be sitting around my teeth, feeding the bacteria that will rot my teeth and ruin my gums. How’s that for motivation? Is water flossing better than flossing tools? There are a variety of flossing tools available including string, waxed string, interdental brushes, air flossers. How can you figure out which one is best for you? First of all, the most important success factor for any flossing tool is that you actually use it at least once a day because plaque builds up every day and can harden into tartar withing 48 hours. So, you need to find a technique that fits into your life and that you enjoy (or at least don’t dread) and then establish a routine that you can easily follow. I leave my water flosser next to the sink as a constant reminder that I need to use it before I go to bed at night. Tucking it away in a closet is a sure-fire way to skip a floss or two until, the next thing you know, you aren’t doing it at all. A number of scientific studies have looked at the effectiveness of water flossing, many of them are sponsored by Waterpik and, thus, compare the effectiveness of Waterpik’s products to other flossing methods. I asked Deborah Lyle, frequently listed as an author on these papers, about the problem bias in studies funded by the maker of the device being studies. She responded that although WaterPik funded many of the studies, the actual research was carried out by scientists at independent institutions (although Deborah Lyle was listed as an author on all of the studies I reviewed). To provide some perspective, it is only fair to point out that many industry-funded studies of consumer products are not carried out in independent institutions, in fact, many consumer products have no studies at all that document that they are effective. Now that I have muddied the waters, let’s take look at the results of some of these studies. In a randomized, single-blind, parallel clinical study of 70 adults, a single use of the Waterpik Water Flosser was compared to waxed string flossing. All study participants first brushed their teeth for two minutes and then flossed under observation to be sure they were using proper technique. The water flosser was found to be 29% more effective than string floss for overall plaque removal. The difference was highly statistically significant. The study was published in the Journal of Clinical Dentistry in 2013 [24(2):37-41]. WaterPik’s Deborah Lyle was the second author on this study. The Waterpik Water Flosser was 51% more effective than string floss for reducing gingivitis after 4 weeks of use (Again, Lyle is an author on this paper). After 30 days of use, the Water Flosser was more than twice as effective as string floss for reducing bleeding on probing in patients with implants. Two studies published in the Journal of Clinical Dentistry, one in 2012 and another in 2015 showed the Waterpik Water Flosser to be more effective than Sonicare’s Air Floss for reducing clinical signs of inflammation and reducing gingivitis and plaque. Both studies were funded by research grants from Waterpik and listed Deborah Lyle as the second author. You should brush and floss daily no matter what technique you use. Water flossing appears to be at least as effective and, most likely more effective than string flossing—particularly if the very low compliance with string flossing is taken into account. Water flossing appears to be more effective than air flossing, but the studies showing this are funded by Waterpik. For flossing haters, water flossing is a great alternative. That’s my opinion, would love to hear yours. Yahooo! Today, after about a month of using my new water flosser, I had my monthly dental hygienist appointment. She couldn’t stop raving about my gums – it made be blush! She noted pink instead of dusky gums indicating and no bleeding all indicating a great improvement in my gum health. My reward? She recommended moving my monthly cleanings to every three months. Water flossing works for me. Disclosure: I was not paid to write this article, but I did receive a complementary Aquarius Designer Series Waterpik Waterflosser to try out. Water flossing is a good method to remove plaque and keep the mouth clean. Also Its very fast than normal flossing. I used to hate to floss, then my hygienist suggested flossing in the shower. I found that a great recommendation. I get the work done and get to stay in the shower a couple of minutes longer. Rarely miss. Recommended it to my kids and they’re doing it too.